Wonder Park is about the importance of never giving up your imaginative spark, and always following whatever weird, idiosyncratic passion is yours and yours alone, and in the process showing the world something incredible that it has never seen. That this message is attached to this movie has broken my irony meter so hard that it has dissolved into a pile of fine dust. To call this "conventional" isn't nearly big enough; this is among the most uninspired, calculated big-budget animated features to have come out in the 2010s. The very best sign of how mechanical the film feels is the issue of its director: it officially doesn't have one. Former Pixar animator Dylan Brown was directing the project until January 2018, when he was fired by Paramount and Nickelodeon Movies over multiple sexual harassment complaints. And it was apparently near enough to completion that the studio decided just to let things wrap up without hiring a replacement. And so Brown is found nowhere on the film's IMDb page (which, along with the attached trivia page, positively reeks of some poor intern spending a long weekend tediously scrubbing and polishing whatever factoids presented themselves - ah, you see, the screenwriters were responsible for casting the movie! - in the hopes of averting a PR disaster. Since absolutely nobody in the world gives two fucks about Wonder Park, no PR disaster materialised*), while the film itself came into a landing basically as the net result of a whole bunch of people doing their work automatically and with no creative supervision. Just about the only thing about the movie that actually does go some minimal way towards that word "wonder" (or even "park"): it turns out that CG animation software packages have evolved enough that $80 million can turn out a pretty lovely motion picture these days, especially when you go cheap on the voice cast. It actually does look pretty great; the backgrounds, lighting and effects, anyway, and the character animation is good enough to get the job done in a world where Illumination Entertainment still exists. Better than any of it, the film is just lousy with really elaborate flyover shots, letting the camera swoop around and catch the titular-ish amusement park from several angles at once, capturing something that of the wind-in-your-hair feeling of a roller coaster. Admittedly, three months after Spider-Man: Into the Spider-Verse, the bar for weightless flying animated cameras sailing in every direction has become incredibly high, and Wonder Park wasn't going to clear even its pre-Spidey level. But it is important to be grateful for tiny fragments of joy when they come by, like if you're hip deep in dead sewer rats, but one of them is wearing a cute bow tie. This particular swimming pool full of bloated rodents centers on June Bailey (Sofia Mali when we first meet her as a wee one, Brianna Denski after she ages up to ten or so), who has an all-consuming interested in developing a magnificent theme park called Wonderland - "Wonder Park" is never said out loud, and why would you ever expect such a stupid thing as a title that matches the content of the film, anyway - drawing out maps and building models and eventually neighborhood-sized roller coaster tracks using household objects. That June is an otherworldly engineering savant is quite overlooked by the film, which would undoubtedly reject the concept of "engineering" as being too much of an adult concern. And that's exactly the point of all this: June is about to be taken in by adulthood, now that her beloved co-creator and mother (Jennifer Garner) has been shipped off to some distant hospital with an unspecified but obviously extremely deadly disease. The girl is so bitter that she rejects Wonderland and imagination itself, and this triggers a huge crisis, for there is of course nothing more heinous than a child on the brink of adolescence becoming aware that there is a time for taking on responsibilities and living in the world. Which is why reality bends in some unexplained way when June is sullenly on her way to math camp (it is extremely unclear whether the film regards math camp as the ultimate in anti-wonder, or an obvious source of inspiration for a design-nerd like June, or even if it was chosen for any reason other than the fact that "math camp" is a mildly amusing phrase to say out loud). Escaping from the bus and running through the woods to return home, where she expects to find her dad (Matthew Broderick) dead from eating too much junk food, she instead stumbles into Wonderland itself, which has been torn about by living chimpanzee dolls birthed from a huge dark cloud symbolising June's depression. I don't really get whether Wonderland actually exists, or if it's one of those "fell asleep and dreamed it all" deals; but like everything else involved with Josh Applebaum & André Nemec's screenplay, it doesn't end up mattering. Whatever gets her there, June is in Wonderland, and as its creator god, needs to repair it, with the help of the profoundly awful cast of wacky animal sidekicks she and her mom created: Greta the warthog (Mila Kunis) the personality-free source of authority and stability as Wonderland collapses; Gus (Kenan Thompson) and Cooper (Ken Jeong), a pair of beaver brothers who are the comic relief figures in what's already a comedy, which means of course that they're basically just stupid and incompetent; Boomer (Ken Hudson Campbell), a huge bear who is basically the park's Mickey Mouse, and is narcoleptic; and Steve (John Oliver), a porcupine who lusts after Greta, gets all the big jokes that the filmmakers clearly intended for five-year-olds to shrilly scream back to their parents over and over again for a week after seeing the film, and is generally just the most ungodly dismal thing. Oliver commits, bless 'im; it's more than any of the actual professional actors involved in the movie can say. Anyway, the plot of the film involves using setpieces to repair some of the big, fanciful rides out of June's wild imagination (which all consist of "quotidian thing X, plus flight"), while also trying to find Peanut (Norbert Leo Butz), the chimpanzee who heard all of June and Mom's ideas and translated them into practical reality, which I suppose makes him Wonderland's Pope. Even by the standards of grueling animal sidekicks in trite animated pictures, the talking animals of Wonder Park are a wretched, hateful lot; only Steve has actual character traits, all of which are inexcusably annoying, while Boomer is vaguely useless, Gus and Cooper are extremely useless, and the entire screenwriting process around Greta seems to have consisted of saying, "we made the boss a girl, so we get girl power points, right?" Though Wonder Park only runs a wispy 85 minutes long, the time we spend with these characters is agonisingly slow and grating. The film's sense of scale works: Wonderland is a huge sprawl full of misty dreamscapes off in the distance, colorful even in its decay. But the characters bring it down to trashy direct-to-video kids' movie territory so readily that even the way-too-good production values don't make it pleasurable. 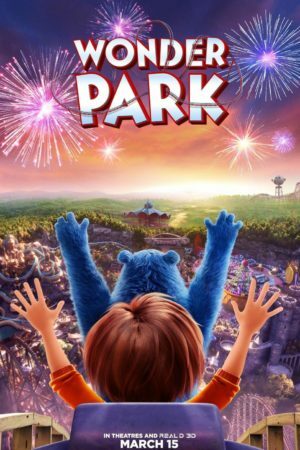 June's neighborhood experiments are the only place where Wonder Park actually feels, y'know, wondrous; this has everything to do, I am sure, with the relatively stronger characters and more interesting family dynamic, and the lack of shticky jokes. That's what's aggravating about this, more than anything else: these people clearly could have made a real marvel of a family adventure in a wildly creative setting, and they only wanted to make this sludgy crapheap of an overpriced TV pilot. So much for childish innocence. *You can also see the exact point where the intern got bored and gave up: "Jeffrey Tambor was originally meant to star in the film as Boomer the Bear, but he was later removed from the project... for unknown reasons". Ah, yes, a mystery for the ages.